Mark your calendars for next Wednesday November 1st!! 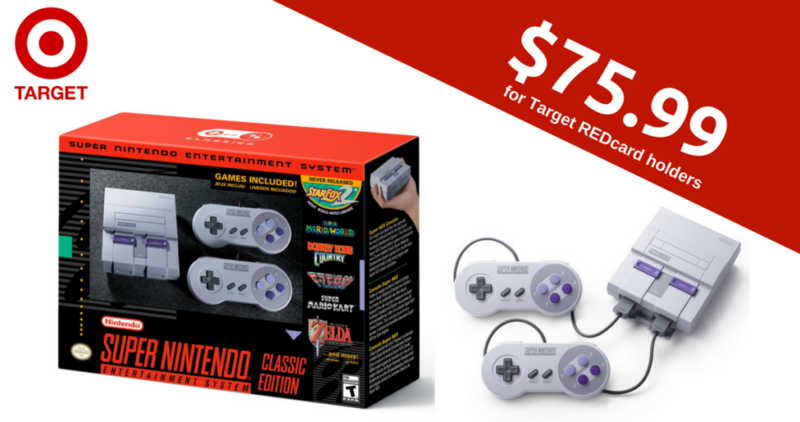 For one day only Target REDcard members can score a Nintendo Super NES Classic Edition at Target for just $79.99 (or $75.99 after your 5% REDcard discount)! If you don’t already have a Target REDcard, you can sign up for FREE! Enjoy perks like an extra 5% off, extra 30 days for returns, FREE Shipping and more. This gaming system gives you the look and feel of the 90’s SNES with all the fun nostalgia that comes with it. It’s loaded with 21 classic Super NES games including the never-before-released Starfox 2. Because this release is one day only, there are limited quantities in stock. Deal valid Wednesday, 11/1, only. Limit 1 per REDcard holder, no rain checks. This is advertised in the upcoming Target ad. There is no time mentioned but I would be ready for it to go live at midnight.